Hailing from Tashkent Uzbekistan (hence the name: From UZ), From.uz is a 5 piece primarily instrumental band that creates a high-energy blend of complex Progressive Rock, Jazz Fusion, and Improvisation, along with healthy doses of Classical and European influences. From.uz was officially introduced to the world through the compositions that they debuted in April 2005 at the Youth Theater of Uzbekistan, in Tashkent. This incredibly energetic and expressive live performance (The CD/DVD combination “Audio Diplomacy”) is testimony to the intense musical statement that is Fromuz. The band’s second full length CD, “Overlook” was released in 2008 to rave reviews, landing on many critics’ top 10 Lists for the year, including some where the band was lauded as releasing the best progressive rock CD of 2008. In late 2008 From.uz entered into its latest incarnation under the leadership of guitarist Vitaly Popeloff and keyboardist Albert Khalmurzayev. The band is hard at work on “Seventh Story” which will be the band’s third official release and their second in two years. In addition to the instrumental sound that has defined Fromuz thus far, “Seventh Story” pushes into new areas including full orchestra for one track and vocals on several others. Stay tuned here for the latest updates, twitter feeds, and news releases on the new From.uz record! [10t Records] ZNR adds: A very fine symphonic rock release incorporating everything from King Crimson to The Enid to Camel to perhaps a hint at Dream Theater! Easily the equal of groups like Tangent or The Flower Kings!! 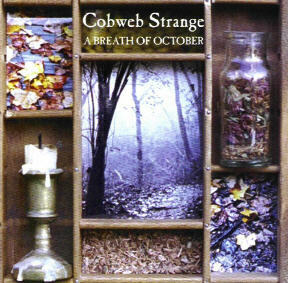 Cobweb Strange "A Breath of October"
Notify me of updates to From.Uz "Seventh Story"